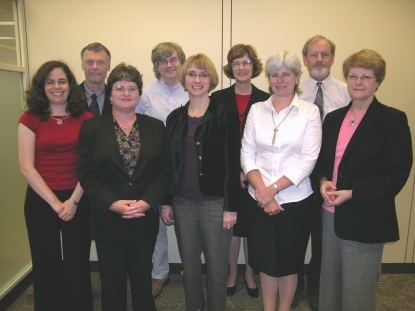 The Joint Steering Committee for Revision of AACR (JSC) met in Washington, D.C. from October 16-20, 2006. This is a brief summary of the meeting; further detail will be provided in the meeting minutes. The agenda provides a listing of the JSC documents for each topic, and the majority of the documents can be found on the Working Documents pages. IV. Do not use AACR2 alone as the source of ideas and practices for RDA. RDA is scheduled for release in early 2009. The JSC confirmed that the RDA Editor is working under the direction of the JSC. The Editor is responsible for conceptual analysis, the development of frameworks for the organization of the guidelines and instructions in RDA, and (in conjunction with the Editorial Team) for preparing drafts. The JSC reviews and approves final drafts. The JSC noted that some identified tasks, such as the final copy-editing and the design of the web product, will be separately resourced. Section 3.2 will be renamed as Media Type and section 3.3 will be renamed as Carrier Type. Other changes were approved to these instructions and to 4.2 (Content Type). Additional categories, which had been identified by the constituencies, will be proposed for inclusion in the RDA/ONIX framework and added to the RDA instructions. An element will be added for file format. The LC proposal as modified by the constituency responses was approved. JSC agreed with CILIP that there is a need to provide instructions for recording the dimensions of a bound item when there is a significant difference in height and/or width between the resource and its binding. The original CILIP proposal suggested changes to RDA chapter 3 to include instructions on accessible formats used by visually impaired people. At the meeting, JSC agreed that some instructions would be better placed in chapter 4, as use of symbol systems to convey meaning is an attribute of the expression. The JSC discussed responses to the draft of chapters 6 and 7 at a high level, reviewing the content of the chapters against the objectives and principles, and discussing implementation scenarios. It was agreed that the order of the two chapters would be switched. The conventions for referencing related resources will be simplified, and more guidance given on when to apply particular conventions. The JSC asked the Editor to prepare alternative outlines for the chapter on related resources for JSC's consideration and decision on the best arrangement. One alternative will parallel the relationships between Group 1 entities as presented in FRBR; the other will parallel the relationship taxonomy developed by Barbara Tillett . The chapter on persons, families, and corporate bodies associated with a resource will also be reorganized to parallel the relationships between Group 1 and Group 2 entities as presented in FRBR. The concept of “primary access” will be removed from that chapter and will be addressed in chapter 13 in the context of naming works and expressions. The JSC met with the Chair of the second Examples Group to discuss work on the revision of examples in chapters 6-7. At the next meeting, the JSC will discuss the detailed constituency comments on the June 2006 draft of chapters 6 and 7. The JSC will prepare a report for consideration at the January 2007 MARBI meeting, highlighting the implications of new RDA elements and instructions for MARC 21. The JSC discussed a status report from the RDA Appendices Group with the Group members. The Group will now begin to work on the content of the appendices, with an initial focus on instructions on the use of abbreviations in chapter 3. The JSC approved proposals for additions to the list of initial articles for the following languages: Breton; Irish; and, Maori and Pacific Island languages. Some issues raised in the constituency responses to these proposals have been passed to the Appendices Group. Building on the successful discussions with the publishing community (ONIX), the JSC met with representatives of the Dublin Core (Diane Hillmann) and IEEE-LOM (Robby Robson) communities during its October meeting. After these discussions, the JSC agreed that further talks could be beneficial to all concerned. To that end, plans are now underway for future meetings with these communities to discuss the various underlying conceptual data models that serve as the basis for our work. The JSC will meet from April 16-20, 2007 in Ottawa, Canada. “Bibliographic Relationships,” Barbara B. Tillett. Ch. 2 in: Relationships in the Organization of Knowledge, edited by Carol A. Bean and Rebecca Green. Dordrecht, Boston, London: Kluwer Academic Publishers, 2001, p. 19-35.